First impressions are kind of a big deal. A good first impression can be the deciding factor on whether or not you even give a game the time of day. Laserlife checks all the appropriate boxes needed for positive first approach: slick box art, a vibrant opening song, a simple yet efficient opening level to get the player used to its mechanics, and a strange, ambiguous narrative thread that's just begging to be pulled. When I first launched Laserlife I was instantly endeared to it. However, as it progressed, the slow realization began to sink in that I had seen ninety percent of the game within the first level. Developer Choice Provisions (formally known as Gaijin Games) are responsible for two of my favorite indie games, Bit.Trip Runner and Bit.Trip Runner 2. Both games combine catchy electronica music with brutal platforming gameplay seamlessly. 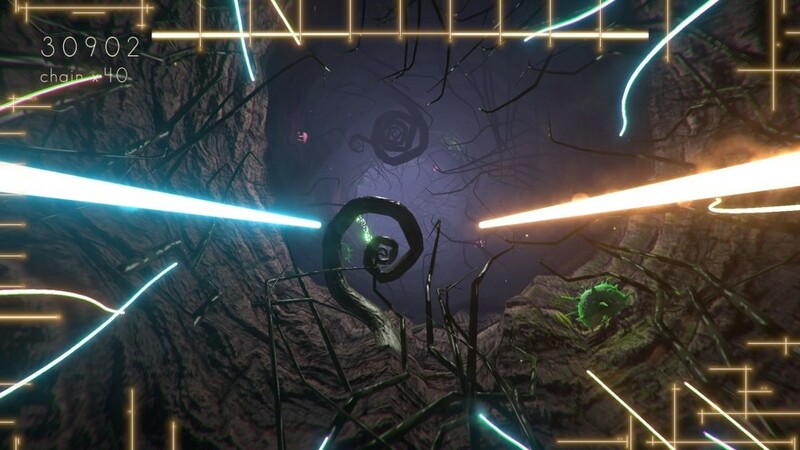 Their latest game, Laserlife, maintains the catchy music but replaces platforming with a sort of twin stick movement-based collection game that is similar to PSN's Entwined. Admittedly, it's difficult to avoid the comparison as the gameplay is nearly identical. But Laserlife is definitely its own game. The first component that really caught my attention was the outstanding soundtrack. I'm actually listening to right now, as I write this review. The music in Laserlife (produced by artist Tracer) is an assorted blend of mainly downtempo, trance tracks that really embolden the games dialogue-sparse story. It creates a mood perfectly in harmony with the games themes and subject material. And most of all, it's just a joy to listen to. The majority of the tracks are awash with dense, synth-laced, droning sounds and simple, rhythmic beats. Staying true to Choice Provisions penchant for syncing up their gameplay prompts with the rhythm of their music, Laserlife does an admirable, if somewhat inconsistent job of keeping the trend alive. Each stage goes through three different sections. The first segment tasks the player with collecting orbs by moving two lasers via the analog sticks. The song in this section generally has a defined rhythm which can make the orb (or memory fragments as they're referred to in game) collecting a blast. Much like the Bit.Trip games, you can play these sections with your eyes closed as the timing for your button presses is perfectly synced with the music. The following section has a theme that ties into the narrative but the collecting is more random and chaotic. And the final section is a short journey through a blue portal that tasks you with merely avoiding a few obstructions. The level then culminates in frantic, stick wiggling as you restore our dead astronauts memories. Oh wait, did I forget to mention the long dead astronaut that's aimlessly drifting in space? Well, that's a thing. The story in this game is certainly interesting despite its minimalist approach. Memory fragments are collected in each level which then, in turn, restore a cherished memory from our deceased astronaut's past. I didn't really get much out of the story that was here, but I have to give them credit for even attempting to weave a narrative into this genre of game. Laserlife's biggest sin is just how sparse in feels in terms of content. I'm usually not one to complain about game length as some of my favorite games have been two to three hour experiences, but issues with variety and song selection hurt this otherwise enjoyable title. There are three core memories that break off into four stages within each memory. Now, when I say song selection, I'm not taking issue with the songs themselves, as they're fantastic, but each of those four stages within each core memory starts with the exact same song. The design choice behind this decision is frankly, rather baffling. The levels themselves do get progressively harder, but any sense of difficulty seems to have been expunged as I was never greeted with a game over or restart screen during my two to two and a half hour playtime. But maybe this was intentional as I think the design philosophy behind this game was centered more around a mood or feeling rather then a difficulty curve. Laserlife is a game where you can quite literally space out to (no pun intended). It's like early Aphex Twin fused with Entwined and sprinkled with a dash of LSD. But it's forgettable. I squeezed a solid two to three hours out of Laserlife but once I was finished, I had no desire to go back and try for higher scores like I did with the Bit.Trip series. I wanted to love this game, I really did; the first stage showed so much promise but the lack of content and variety cemented this as an average game with a killer soundtrack and lofty aspirations. What Remains of Edith Finch is a strong contender for my Top 5 Games of 2017, and even if you might not consider yourself a fan of the genre, I would still strongly encourage you to give this game a shot. Tokyo RPG Factory's sophomore release, Lost Sphear, has me slightly bewildered. It was never exactly touted as a game that was going to revolutionize the genre. I've never been the one to yearn for the games of yesteryear, which is why Lost Sphear feels like a throwback JRPG checking all the boxes on the genre nostalgia spreadsheet. There are things to like in Nom Nom Galaxy but they're buried in a mire of tedious gameplay that feels more like doing chores than actually having fun.